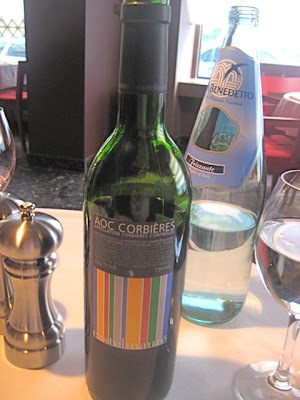 I'd been thinking about trying Le Cornichon since I first heard about it more than a year ago. We finally got around to having dinner at this French restaurant in Old Town. The interior is a modern art piece. Lots of acute angles, funky fixtures, and clashing colors. 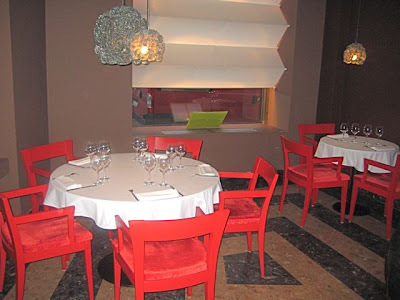 Brown and beige walls stand in stark contrast to red chairs and white table cloths. 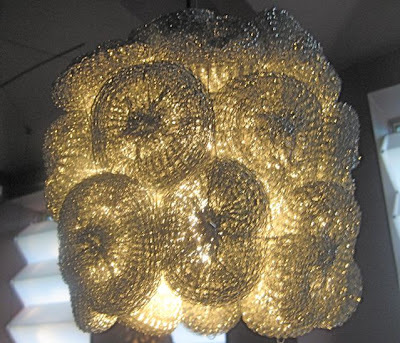 And then there are the light fixtures. The shades are made from steel wool. We sat down in the back. Just a few tables were occupied. Immediately, we noticed the music. V calls it "Doots! Doots! Doots!" music (That's as close as I can get to her verbalization of the techno style tracks). 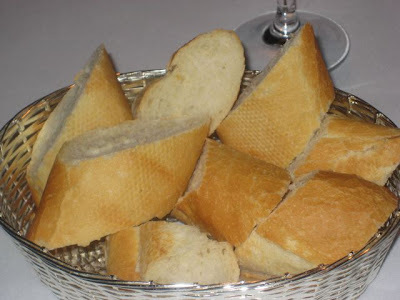 We receive a bread basket filled with fresh baguette slices. Then came an amuse bouche. 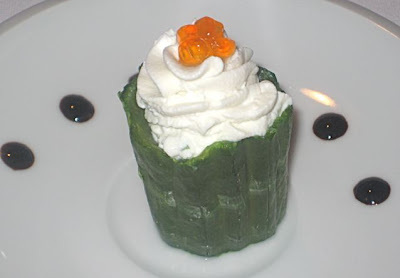 It was a partially cooked cucumber topped with something like cream cheese, and a few caviar eggs. Both of us found the texture of the soft, watery cucumber rather unpleasant. There wasn't much flavor to it, either. V took one small taste and pushed it away. I ate it, but only because I was hungry. I know it was a gift, but still, it's hard to imagine who would appreciate such an offering. For an appetizer, I wanted something I hadn't tried before. I ordered the oeufs en meurettes (190 CZK). That's a poached egg on bread, smothered in a wine sauce. It was really delicious -- everything I hoped it would be. I enjoyed every bite of the tangy, buttery sauce. When my fork broke the soft egg, the yolk ran into the sauce and made it even richer. There was bacon on top. I cleaned the plate with pieces of bread. 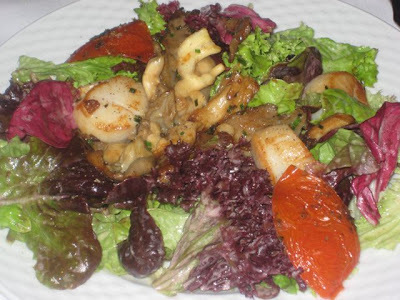 V ordered the Cornichon Salad with scallop and pleurotte mushrooms (260 CZK). It came with three good-sized scallops. They were fresh and properly cooked. But V found the oily dressing boring and the whole thing fairly bland and uninspired. We ordered a bottle of wine with our meal. I asked our waiter to recommend one of three possibilities from the Languedoc-Roussillon region. They were all similarly priced, but I was impressed that he suggested the cheapest one - the Corbieres Domaine Castelmaure (460 CZK). It was an uncomplicated wine, but we liked it more and more with each pour. We asked for a large bottle of water and got San Benedetto still water (160 CZK). I much prefer cheaper bottles of Mattoni, but that's me. 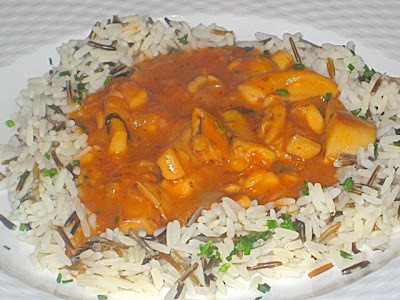 For a main course, V got the Corsican squid (295 CZK). The somewhat thick chunks of squid were fresh and tender, not overcooked or chewy. V loved the bed of mixed wild rice. But that was her favorite part. She said she liked it, but might not get it again. The dish failed to inspire desire. It tasted of the sea -- of seafood and salt -- but not much else was going on with it. Simplicity can sometimes lead to greatness, but I thought this was just too simple. 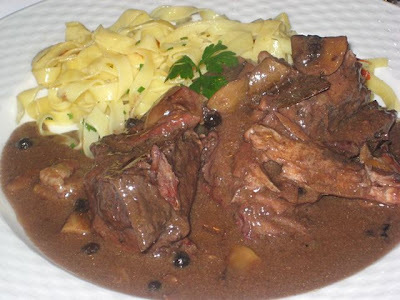 I ordered the coq au vin with tagliatelle (295 CZK). It was a very ample portion. The meat had been cooked a long time and was tender, though not terribly moist. I thought it was too salty and V agreed with me at first. She decided to mention it to the waiter. He expressed dismay and insisted on going to the kitchen himself. He returned with a knowing look. "It is not too much salt. Our chef uses very little salt. It is the dry wine he cooks with." "Ah," V said. "And do you use chicken or do you really get roosters?" She thought ours was a rooster, but she wanted to be 100% sure. "We regularly get old roosters delivered from Moravia," he replied. 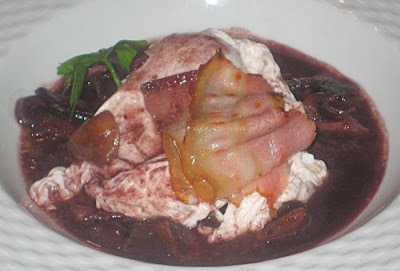 After the waiter left, she tried some more of my coq au vin. "I don't think it's too salty," she said. "There's your pro-Moravian bias again, I teased. "If it was a Bohemian rooster, you wouldn't be so forgiving." "No, it's not too salty." I backed off. No need for a cockfight in the middle of dinner. Mixing the sauce and meat well with the tagliatelle did make it better, cutting the salinity (or dry wine) level. And there was so much meat, we took some home and made another light meal out of it the next day. I did enjoy it more at home for some reason. For dessert, I ordered the fondant (160 CZK). This was not the liquid chocolate center cake that also goes by the same name. Le Cornichon's version was intensely chocolately, but also intensely sweet. 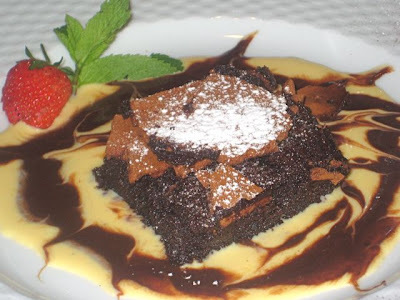 It was too sweet for me, and I am a chocolate fanatic with a sweet tooth. 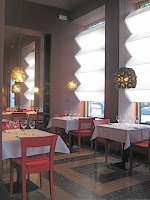 We both felt the rustic-oriented cuisine clashed with the fashionable, modern interior. It's just a subjective feeling, but the food didn't feel like it belonged there. The only choice that really grabbed me was the egg dish. V liked it, too, and she's not a big egg person. We'd both order it again. For a stylish place in the center, the prices were not over the top. 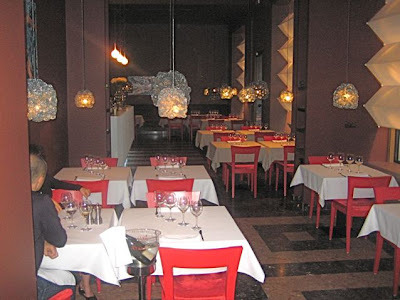 But our bill, in part because of the wine, was 1790 CZK before tip. Not a cheap country dinner. Le Cornichon was not bad, but nothing special for either of us. I'd try it again if someone else suggested it, but won't be rushing back on my own account. If forced to choose, I prefer wit over salt. So I enjoyed the conversation more than food.